Madeleine Elizabeth Sloane (Jessica Chastain) is the most powerful lobbyist in DC. She brings to the table a winning attitude and a ruthlessness that make her the best at what she does. She fights for things she believes in; that's how she sleeps at night, she says. When the head of the gun PAC wants to engage the services of the firm she works for, and hers in particular, Elizabeth expresses with conviction that she is pro gun control. No, she doesn't know any victim of guns; that is something she firmly believes in. Elizabeth is then approached by the CEO (Mark Strong) of a small firm, to win Senators to vote in favor of a bill that would impose universal background checks for arms buying. She is convinced that that may be the biggest win of her career, or her downfall... if her rivals have any saying in it. 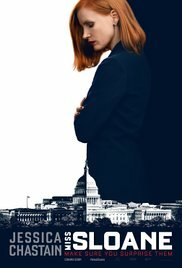 Miss Sloane, directed by John Madden, is probably the gutsiest movie of 2016, but I bet not many people have heard of it. It would have had a wider audience had it not been on the thorny debate of gun control and universal background checks to delay, if perhaps not prevent, criminals and would-be criminals from arming themselves legally. Both sides are debated with passion, but no definitive conclusion is reached in the movie if only because we, Americans, haven't reached a consensus on the issue, thanks, partly, to the immensely powerful influence of the pro-gun lobby. In the leading role is Jessica Chastain in, what is in my opinion, the best performance of her career. That is saying something because her relatively short career is hallmarked by outstanding performances in even more impressive movies, such as The Tree of Life, The Help, The Debt, The Disappearance of Eleanor Rigby (Her, Him, Them), Zero Dark Thirty—for which she was nominated to the Oscars as Best Actress in a Leading Role, which she should have won by a long shot—, Interstellar, Crimson Peak, and the most recent and commercially successful The Martian. A movie about gun control will never be a commercial success until we as society tackle the issue head on. Until then, we may bury it among the hundreds of movies of any quality that are made yearly, because of its prickly topic, but kudos to Jessica Chastain for giving her best in a performance that should not have been ignored at the Oscars—it rivals that of Isabelle Huppert in Elle—, and double kudos for having the courage to take on this role in first place. "A movie about gun control will never be a commercial success until we as society tackle the issue head on. Until then, we may bury it among the hundreds of movies of any quality that are made yearly, because of its prickly topic..." Buried along with the victims of gun violence. Excellent review! You obviously really liked this film. It goes on my watch list. Well said, Dorothy! I went knowing only that Jessica Chastain was in it. Oh boy...was I greatly surprised! Excellent review and thank you for alerting me to this movie, because you are right. I had not heard of it. And Jessica Chastain is an amazing actress. Thanks, Judy! This is her best yet in a career full of noteworthy performances. By the way, I watched Cafe Society the other week. I thought I had heard about it from you but I couldn't find your review. Perhaps it was in one of your snapshot posts. I liked it, especially the sets. It was pretty light for Woody Allen but he showed his love for Hollywood. Yes, you heard it in one of my Snapshots. I commented that it was very light, and overall a goody. I totally agree that this is Chastain's best performance so far. And that's saying something since her career is totally impressive! I also really enjoyed her in The Debt and The Help (her physical transformation in The Help was pretty impressive too). She was a force of nature as Miss Sloane. Hi Carmen, I have seen the movie Miss Sloane and really quite liked it (no matter its believability at a couple points). I enjoy DC / Capitol Hill kinds of movies and this one definitely held my interest. The twists were compelling. I liked Chastain in the role and think she showed some guts by taking on The Zookeeper's Wife which she did well in too, though the movie is a bit flawed. I have The Zookeeper's Wife on my wishlist for when it comes out for rental. This sounds great - I really like Jessica Chastain anyway and you're right - what an excellent career she has had so far. I'll keep my eye out for this one - what a shame it seems to be swept under the carpet. With that topic nothing less would have been expected.